Kuwait Automotive Im-ports Co WLL — Al Shaya & Al Sagar — the author-ized distributor for Peugeot vehicles in Kuwait held an exclusive test drive event at Box Hill College on March 5 and offered students and staff chance to test drive the all-new Peugeot 3008 and 5008. During the event which lasted from 9:00 am to 2:00 pm, a range of models of Peugeot displayed, delicious catering was provided. The driving test programme started at 10:00 am with the registration of the partici-pants. 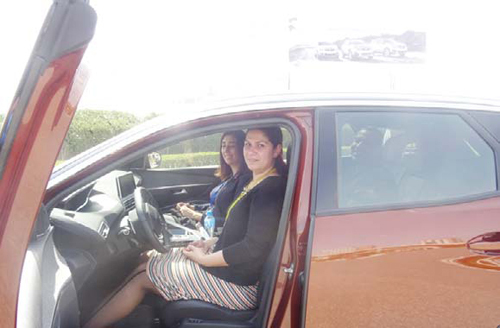 After a simple explanation of the rules of driving and road safety, reviewing the features of vehicles and highlighting their latest technologies, students had the opportunity to experience Peugeot new models and to discover refinement, innovation, and performance of the Peugeot 3008 and 5008. The participants expressed their satisfaction about the elegant design and comfort features of 3008 and 5008. On the sidelines of the event, Peugeot Al Shaya & Sagar held a draw among students who have test driven the vehicles. 3 winners left with a KD 200, KD 100 and KD 50 gift card from Al Shaya. "The way for you to be convinced of your dream car and to make sure it feels right for you and your driving needs, is to test drive it," said Ashish Tandon, general manager of Kuwait Automobile Import Company. He added, "KAICO will organize such as event to raise awareness among the youth on how to choose next car." In support to the start of their professional life, KAICO offered Box Hill students' special offer on their next purchase from the large range of Peugeot: free service, free registration and golden fully com-prehensive insurance. The new PEUGEOT 3008 offers a unique blend of style, comfort and road handling. The spectacular PEUGEOT i-Cockpit® is state of the art and gives new meaning to being in the driver's seat. It offers a more intuitive and intense driving experience, with a com-pact steering wheel, 12. 3"head-up display and central capacitive touch-screen console with ergonomic piano keys to top it all off. 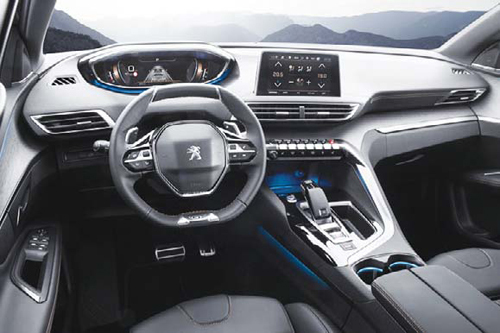 The new PEUGEOT 3008 also of-fers a number of driving aids and other high-tech equip-ment, as well as seamless connectivity. The all-new PEUGEOT 3008 has elegant head-lights with black and chrome trim, which further emphasize the new modern, feline look. These head-lights incorporate LED daytime running lights, and full LED headlights. The 3D-effect LED claw lights at the rear of the vehicle make an instant impact. These lights are vis-ible by day and at night and give the all-new PEUGE-OT 3008 SUV its powerful identity and impressive presence on the road. The powerful and sleek design of the New SUV Peugeot 5008 makes an instant impact. Its stylish sil-houette, Black Diamond roof and grille with chrome fins create an elegant design with spacious and gener-ous dimensions. Whether you are alone or with passengers, your driving experience is taken to a whole new level on board the 7-seater SUV Peugeot 5008. With its three individual seats and third row of two seats that can be folded away and taken out, configure your new SUV 5008 just the way you like it, to ensure your passen-gers have a comfortable journey.